Fox News host Tucker Carlson went on a rant about who tacos really belong to during a Thursday night interview with Univision anchor Enrique Acevedo. Carlson and Acevedo were discussing the recent controversy over a Mexican restaurant in Houston posting, and later apologizing for, a photo with Attorney General Jeff Sessions, who had dined there. Carlson and Acevedo were discussing the recent controversy over the owner of Houston restaurant El Tiempo Cantina posting a photo with Attorney General Jeff Sessions, who had dined at the restaurant. After receiving a wave of heavy public backlash and criticism, the restaurant’s owner Roland Laurezano eventually issued a public apology and then later deleted El Tiempo Cantina’s social media accounts. Many critics were upset that the phrasing of the post seemed to support Sessions, who has recently come under fire for the Justice Department’s controversial immigration policies that disproportionately affect Latino and Hispanic people. 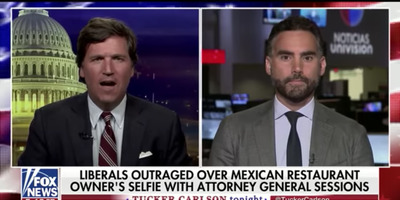 Carlson accused Univision, and the Hispanic community more broadly, of “pummelling” El Tiempo Cantina for “stepping out of line” by criticising the restaurant for serving Sessions. Acevedo responded that “no one” owns tacos, and “we should all celebrate each others cultures.” But Carlson still took issue with the idea that tacos are anything but American.